Lie on a flat bench while holding two dumbbells. Palms are facing inwards to each other. Lift the dumbbells pulling them up above you. At the end of the movement, the dumbbells should be above you at shoulder width. Hold the dumbbells using pronated grip (palms facing forward). The elbows are pointed out. This will be your starting position. Keeping the upper arms (from shoulders to elbows) stationary, slowly lower the weight in and down in a semicircular motion as you inhale. 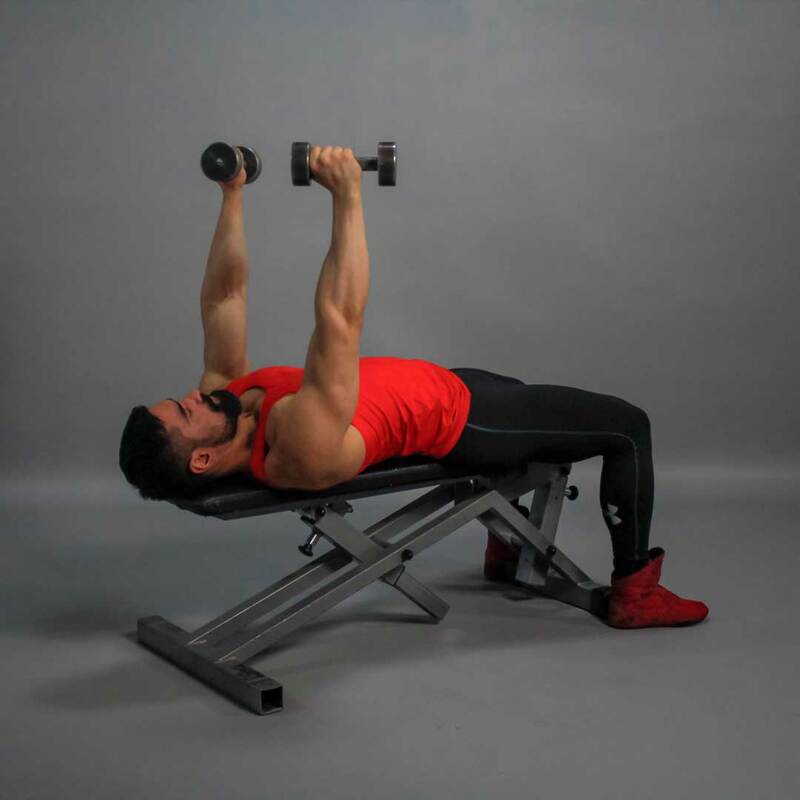 Continue this movement until the dumbbells touch the upper chest. 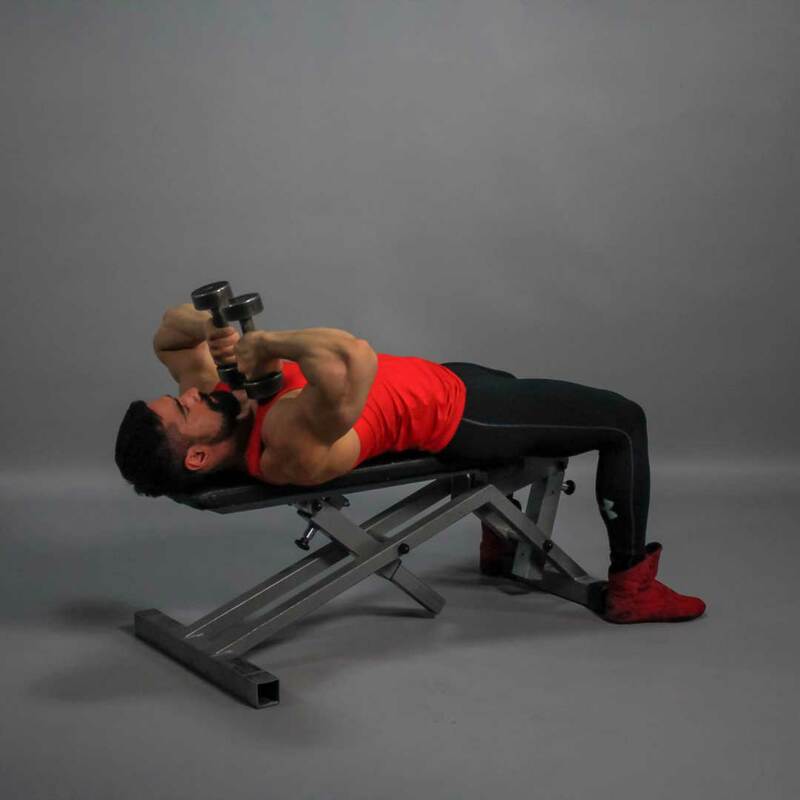 Exhaling, raise the dumbbells up along the same trajectory, contracting your triceps. Keep your elbows together at the top position. Hold in this position for a few seconds and lower the weight down slowly again. It should take at least twice as long to go down than to come up. Precautions: When you are done, do not drop the dumbbells on the floor, as this could lead to injury of the wrist. Tip how to correctly finish the exercise: Bend your knees, twist your wrists placing the dumbbells on top of your thighs. Simultaneously, push your upper torso up by performing a kick forward with your legs. Place the dumbbells on the floor.